Are you sending your kids to a daycare full of other kids who have a few too many unidentified dripping objects coming out of their noses? Make sure that your child is going to a daycare that has the EverPURE stamp of approval. Mold Buster’s two-part daycare cleaning system will not only disinfect every toy and table top, it will create a barrier against bacteria and virus’s that will keep your little one from getting the sniffles. Mold Busters uses a two-part system to create a germ barrier for your child’s daycare. 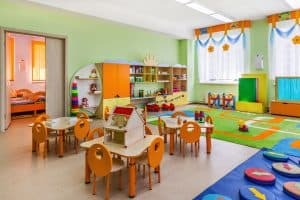 In a typical daycare, a staff will spend countless hours wiping down every toy, table top, chair and wall to make sure there are no germs left behind by the children. The task of daycare cleaning can seem daunting and near impossible. Mold Busters provides a better way to perform daycare cleaning, disinfection and sterilization. The first step of the daycare cleaning system is called InstaPURE. Mold Busters will fill your building or room with an EPA approved dry fog called InstaPURE. This fog is ultra penetrating and leaves absolutely no residue. Once the fog has filled the capacity of the room and has made contact with all surfaces, it remains suspended in air for a desired dwell time. Once all areas are killed, Mold Busters begins step number two of the daycare cleaning system. The second step of the daycare cleaning system is providing you with protection. Using a similar fog to step one, a new EPA approved fog called EverPURE is introduced to the room. EverPURE is dry and leaves no residue but creates an antimicrobial surface on every square inch of the room. This will insure that for 90 days, your daycare will be germ free. This daycare cleaning system can be accomplished in the evening or weekends when the daycare is closed.